One of my must-make stops on our recent trip to London was my favorite sandwich shop when I lived there, Pret A Manger. It's a simple place that's committed to using the freshest ingredients and it really shows in the taste of their food. When we stopped in I found, to my delight, that they had created a cookbook. There is a spread that they use on their sandwiches called pickle and it's absolutely delicious. I made it to go on the sandwiches for our beach picnic. If you need some tart sweetness to complete a sandwich, this should be your go-to spread. My favorite application for it is Pret's mature cheddar sandwich. Absolutely delicious. I love finding new spreads for sandwiches to replace my usual mayonnaise. This picture is taken right after adding the water. After 45 minutes of simmering, it will be a dark mix of intensified flavors. Yum. Heat the oil in a medium pan and add the onion. Cook the onion until translucent. Add each ingredient, in order, allowing the mixture to warm through after each addition before adding the next. Once the water is added, but before adding the salt, bring the mixture to a boil and reduce to a simmer. Simmer for about 45 minutes until reduced and thickened but before the mixture is sticking to the bottom of the pan. For a smoother pickle (which I prefer) puree half the mixture in a food processor and then mix back in with the remaining half. Cool and then store in the fridge to use on sandwiches. Enjoy! Now that is interesting - I haven't made a pickle with all balsamic before. That must give it a really lovely smooth flavour! ooooooo....that is so much easier than the pickle that I make! I must make this straight away! My pickle takes ages to make. How long did you live in London? I lived in Kent for quite a while myself and still miss the wonderful foods. A cheese and pickle sandwich on two slices of Kingsmill bread is heaven. Hi Foodycat - How do you make your pickle? i really really hate pickles but i do like all of these ingredients and i love fruit with balsamic, so i could be convinced to try this! 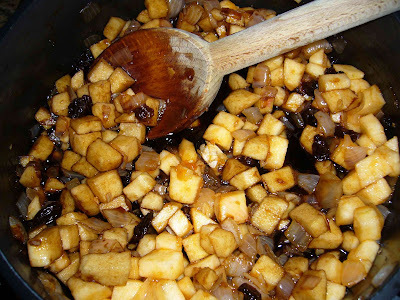 Similar ingredients - apple, dried fruit, onion, spices, sugar, but usually with cider vinegar, so it is pretty sharp. I haven't made it in ages though! Lauren - I personally love pickles so I can't atest to how someone who hates pickles will feel about pickle spread, but it is a very different flavor than pickles. Do you like balsamic? If so, you may want to give it a try! Foodycat - I'll have to try it with the cider vinegar next time. Or maybe a mixture of both? Thanks for the tip!